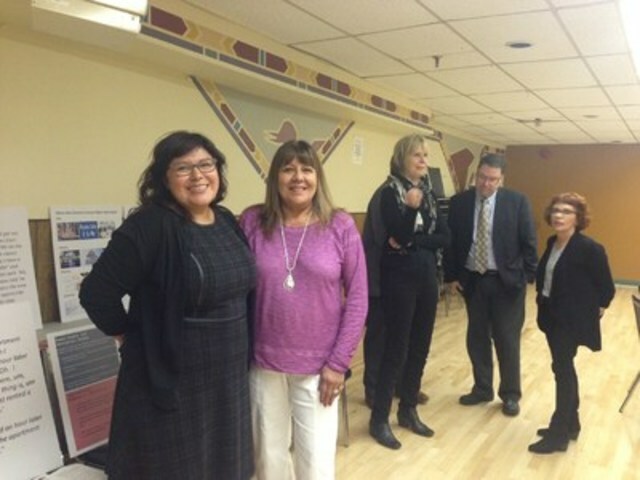 SUDBURY, ON, Sept. 22, 2015 /CNW/ - The N'Swakamok Native Friendship Centre welcomed the Ontario Federation of Indigenous Friendship Centres (OFIFC) and the Human Rights Legal Support Centre (HRLSC) today to launch the Provincial Aboriginal Human Rights Training Initiative. Funded by the Law Foundation of Ontario, the project will deliver training to Friendship Centre staff across the province to promote access to legal services for Indigenous people experiencing discrimination. At the launch at the N'swakomok Friendship Centre today, representatives and staff were on hand to discuss the initiative. "The disproportionate rate at which Aboriginal people experience discrimination has not been reflected in applications to the Human Rights Tribunal of Ontario. This ground-breaking project will train leaders and front line staff in Friendship Centre communities across the province on how to identify and name discrimination and how to access the systems that are in place to seek support and pursue remedies." said Marie Meawasige, Executive Director of the N'Swakamok Native Friendship Centre and Secretary of the OFIFC. "Providing legal information to people living in rural and remote communities and promoting and enhancing access to justice for Aboriginal peoples are key priority areas for the Foundation," said Paul Schabas, Chair of the Law Foundation of Ontario, commenting from Toronto. "This is a powerful opportunity to empower Aboriginal communities to tackle discrimination in a strategic, concerted and province-wide effort," said Lori Mishibinijima, Legal Counsel and Coordinator of the Human Rights Legal Support Centre's Aboriginal Services and Outreach. The OFIFC is a provincial Aboriginal organisation representing the collective interests of 29 member Friendship Centres throughout Ontario. Friendship Centres improve the quality of life for Indigenous people living in urban environments through self-determined, culturally appropriate activities that encourage equal access to, and participation in, Canadian society. The Human Rights Legal Support Centre provides free legal support to people across Ontario whose human rights under Ontario's Human Rights Code have been violated. The Board of Directors of HRLSC is meeting in Sudbury tomorrow. The Law Foundation of Ontario is the sole foundation in Ontario with the unique mandate of access to justice. The Foundation helps Ontarians to understand the law and use it to improve their lives.